It’s that time of year again. That’s right, summer is here and school is out. With it comes a little breathing room for parents, school teachers, and all who contribute to the learning process of our kids throughout the school year. Slower pace, notwithstanding, this is not the time to completely relax in all areas. 1. Choose a day, preferably more, when everyone can be home at the same time to have a meal together. Place this on everyone’s schedule and/or calendar so no one will forget. NOTE: This can be any meal. The focus here is selecting a meal where the entire family can sit together. 2. 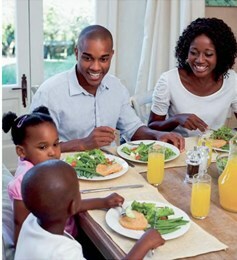 Have kids practice setting the table and using basic table manners. If any family would like help with this step, Avenues of Excellence offers complimentary “family time” etiquette training to show parents, and caregivers, how to set the table properly, and more importantly, how to get the family engaged. 3. Turn off the television and electronic devices. The purpose here is to get the family to start communicating with each other. This is a great time to find out about what everyone is doing, as well as likes or dislikes. 4. Communication. This is another essential social skill because here you can practice speaking at the table while eating and, more importantly, enjoying actually having a conversation with each other. NOTE: This is not the time to have a heated debate, but rather, to find out perhaps what may need to be discussed later. Focus on establishing (or deepening) the lines of communication first. 5. Tidy up. Yes, there’s even enjoyment— and learning—in cleaning up. This can train children to pick-up after themselves and have courtesy, and respect at home, which extends to how they behave outside of the home. Do you have an etiquette or social protocol question? Send us an email at info@avenuesofexcellence.com.